The global recession hit the commercial and residential building industry hard, and the world’s biggest flooring supplier was not immune to the slowdown. Shrinking demand forced Mohawk Industries to reduce its workforce by roughly 20 percent, and the company saw morale start to slip as staff worried about their futures. In workplaces, one of the biggest contributors to employee attitudes is the quality of communications. Mohawk’s human resources department realized company methods for getting information to all staff, across all facilities, wasn’t working. Part of the problem was a large percentage of staff working in manufacturing and distribution didn’t have access to work email. And having local managers to relay to their line staff the emails they received from the head office was, at best, unreliable. There were bulletin boards, but what was posted wasn’t necessarily seen. The communications gap was particularly frustrating because Mohawk has staff benefits and services that are enviable within the manufacturing industry, but a lot of their workers knew little or nothing about them. Human resources saw an opportunity to use large digital display monitors that were visible to most or all staff in common areas to distribute important messages about benefits, services and critical workplace safety tips. Vincent Grosso, a communications specialist with Mohawk, developed a homegrown trial project that involved putting a pair of flat-screen TVs at a Mohawk facility in nearby Dalton, Ga. He produced his own content and uploaded material manually. The initial programming heavily referenced corporate health and safety websites, so Grosso and his HR colleagues started paying attention to the online analytics that measured traffic. “We were seeing spikes, like crazy, as soon as we turned the screens on, so we knew people were seeing the messages and responding to them,” Grosso said. That was enough evidence to convince Mohawk to move beyond a test phase and develop a full program. It also meant the company needed to shift to a commercial technology solution that could meet the scale of as many as 500 different facilities, all with unique content programming. Grosso scanned the marketplace, looking at scores of solutions, before settling on UCView. He liked the solution set, the price point, the ease of use and, particularly, the sense that UCView would help tune the solution to Mohawk’s needs and stick with him as those needs evolved. By fall 2011, the company had more than 100 displays in 53 of its plants, as well as plans to roll the program out across the company’s full manufacturing and distribution estate. Mohawk’s central human resources department manages the network and develops the majority of the programming. Local plant managers who budget and opt in to the network have the capability to develop and post location-specific messages. The core programming seen by staff—on large monitors in break rooms and other areas—serves a range of purposes. Mohawk has Healthy Life Centers at several of its major manufacturing facilities that provide health services, such as health risk assessments, monitoring of chronic conditions, access to healthcare coaches and free or reduced-cost prescriptions. The screens are driving awareness and traffic to the on-site centers, which is improving general wellness levels among staff and reducing long-term health care costs. Programming also drives awareness of the wide range of other health and financial benefits available to Mohawk employees. “We drive them to a flood of benefits on our websites that a lot of our staff, until we started doing this, didn’t even know were there,” Grosso said. The sheer size of Mohawk’s workforce also introduces other benefits for staff that are promoted on screens, such as significant discounts for mobile phone plans from the nation’s largest carriers. Safety tips are also steadily developed and refreshed to reinforce the risks always present on busy manufacturing and shipping floors. The screens run news and local weather apps, as well as local real-time traffic maps that help plant staff plot their easiest routes home at night. 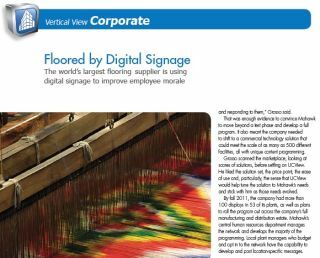 An unexpected but powerful spin-off benefit of the UCView digital signage software platform is the integration developed with Mohawk’s tufting machines—essentially huge sewing machines—that make carpeting. UCView’s software engineers developed the necessary interface to read and dynamically display the efficiency levels of each machine as it runs. A display centrally mounted on the plant floors, within easy view of operators, shows a color-coded roundup of all the running units, offering real-time video cues of any looming problems. Grosso says UCView’s relatively simple integration work warns operators of falling efficiency levels on the machines, preventing costly breakdowns before they happen and prompting adjustments before the machines start producing flawed, unmarketable carpeting. “Company-wide, we think we’ll be saving millions of dollars,” he said. The bottom-line impact will just build with the real-time efficiency reporting on the plant floor, but Mohawk is also paying close attention to how employees are reacting to this new form of communications. Awareness of benefits programs is up, and local plants are using the screens for their own notices and staff recognition. Grosso says the HR team agreed that if 80 percent of Mohawk staffers were receptive to the program, it was a clear indicator of success. Surveys are suggesting the buy-in level is actually in the 90th percentile. According to Grosso, there’s been a noticeable difference in employee morale, thanks to a combination of a commercial and residential building industry that’s rebounding and steady reinforcement that their employer has their back. “This is one step that makes our people feel a little bit closer to things getting better,” he said. Mohawk uses UCView’s turnkey Software as a Service (SaaS) managed service option, which allows server maintenance and upgrades to be controlled by the vendor and minimizes Mohawk’s day-to-day IT needs. The cloud-based service allows clients the ability to easily scale up without hardware investments or additional development, while paying a low, predictable monthly fee per site. UCView’s responsive development team has also been very important to Mohawk.